When the UK voted to leave the EU it sent shockwaves across the world. Richard Saunders examines the changing landscape in the aftermath of Brexit and explores what the economic future might look like. Richard Saunders is well placed to talk about Brexit and the implications the referendum will have on economies across Europe. 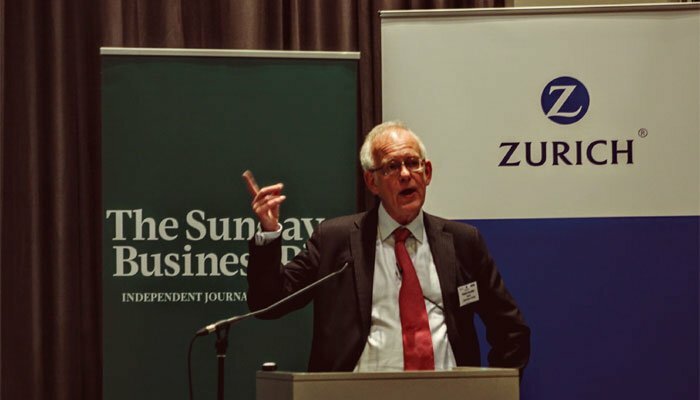 In Ireland, Saunders is a consultant risk adviser to the Central Bank, and in the UK his extensive experience as CEO of the Investment Management Association and his 20 years at HM Treasury, means he sees things from a number of economic perspectives. Saunders maintains that the result of the referendum was not what was expected and that Brexit will remain a core part of the economic backdrop for the coming years. "It's early days but I think the real significance here is that perhaps the 'remain' campaign was over zealous in predicting an immediate slow down," he says. "The real economic impact will be more long-term. Central to this is what the impact on inward investment will be and that in turn is going to depend on what the terms of the UK's departure from the EU are." Saunders adds: "There are two areas that have seen an impact - the first is sterling which fell 10% against both the euro and the dollar briefly after the referendum outcome, and which has continued to fall since." At one point in October, one pound sterling could buy almost $1.22 and a euro could get 91p. This has been seen as the currency's worst performance since the aftermath of the vote and investors and government officials have said that there is the potential for more declines in a market still trying to recover 10% flash crash. "The second impact, which I think is very interesting, is the impact on long-term interest rates given that the 10-year gilt yield fell 50 basis points to 80 basis points following the Brexit referendum," Saunders adds. He explains that the Bank of England introduced a package of measures to inject liquidity in the economy, it cut interest rates further and the immediate impact is that long-term interest rates dipped again and then they came back. "What that shows is that the impact of the Bank of England was relatively short-term but the impact of the Brexit referendum vote has been longer-term. Of course that change is one that has a very direct impact on pension funds. Deficits will get bigger because of the lower discount rate applied to liabilities," he says. Another direct impact of the referendum was in the fund management industry where there have been significant outflows from the UK over the last couple of months. "Particularly hard hit, again in the immediate aftermath of the referendum were property funds, which lost about 10% of their value," Saunders explains. "That's slowly unwinding and they are starting to open or reopen partially - but that's probably the single biggest most direct impact that's been seen in the UK financial sector following the referendum result. Because the referendum is not legally binding, the future for the UK's trading relationship with Europe remains unclear. According to Saunders, the UK government are looking for the best of both worlds by having full control over its borders and labour market, while at the same time establishing a 'unique trading relationship' with the EU. The big question remains as to whether or not they can have it all. "The politics of this is very difficult", Saunders argues. "The conservative government has a very small majority and I think that within the conservative party the majority of the members of the party would have voted to remain. There are members of parliament that are unhappy with the result of the referendum and there are other members that are keen to get on with it. Maintaining that political balance is going to be very difficult and that is one factor that is making this complicated and that is why we have heard so little about the direction the government is going to take," he adds. Saunders agrees that Brexit is extremely complicated, especially given that EU policy, trade and legislation has been intrinsically woven into UK law for more than 40 years. "The sheer complexity of Brexit is only becoming apparent now," he says. There has been a lot of talk of soft Brexit and hard Brexit, with many arguing that there must be a transitional period of negotiations given that the issues are so complex. There are others, Saunders explains, who think that the UK should get on with it - cut the ties, walk away, rely on World Trade Organisation (WTO) rules and get the message out that the UK is open for business. "That sounds simple but it's not simple. For a start, when the UK leaves the EU it loses its membership of the WTO because the UK is a member only through its membership of the EU. Now, the UK will have to join the WTO again in its own right and joining isn't as simple as it sounds." Saunders says the odds are in favour of a soft exit simply because it's in everyone's interest, not just in the UK - where businesses are pushing hard for this - but also in the rest of the EU. "One must hope that common sense will prevail on both sides," Saunders says. There is no question, Brexit it is going to be a core part of the economic backdrop for the coming years," he concludes. Richard Saunders is a Consultant Risk Adviser to the Markets Supervision Directorate, Central Bank of Ireland. Previously, he was the first CEO of the Investment Management Association in the UK and before that he spent 20 years in Whitehall, principally at HM Treasury, where among other roles he served as Press Secretary to the Chancellor of the Exchequer.